Molly Laffoley painted this in 1985. Winifred Harvey donated it to the Grand Manan Historical Society 13 April 2009. The donation was done by Margaret Harris, Director of the Art Gallery when it was still under the ownership of the Grand Manan Historical Society. This painting was on display at the Grand Manan Art Gallery for the summers of 2009, 2010, and 2011. 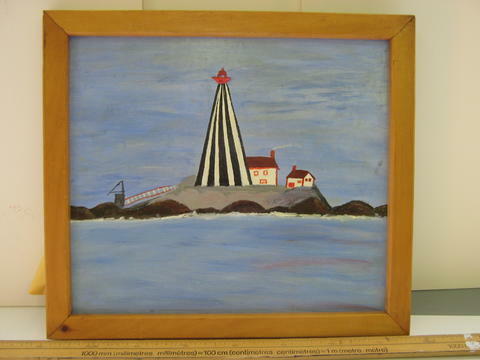 This item is a framed painting of Gannet Rock Lighthouse. It is painted with oil paint on Mason Board. The image shows the black and white vertical striped lighthouse and the white with red trim keeper house and outer building. Also visible are the rocks the lighthouse sits on and the walkway to the landing area with the hoist for landing supplies.